Great Deal on this single family only 1 mile from the ski area. Nestled in a popular neighborhood with great views of the ski area and the Core Trail System out your front door. Spacious open great room with eat in kitchen, gas stone fireplace and newer wood floors. Three bedrooms, three bathrooms and an additional downstairs family room make this perfect for a family or couple who want room for visitors. Hot water baseboard heat makes for efficient heat source and the two car garage has tons of storage for all your toys. 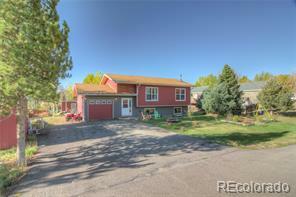 Two fenced yard areas, deck space, hot tub and extra wide driveway for extra parking. One of the best locations in Steamboat!